I'd already had a delicious meal and we'd settled in to watch part two of Ken Burns' The National Parks. We'd caught part one yestereve and it is some wonderful stuff. Tonight he is tweaking the Wife's nerve by talking about bird poaching, flower hats, and the unique landscapes. Then, I got the munchies. I stopped stocking Oreo's and Ben and Jerry's Willie Nelson's Peach Cobbler Ice Cream, but some how had ended up in Spaceway the other day and had to check what they were peddling in the tinned fish aisle. I picked up two tins for just such an occasion. A quick nosh while listening to Peter Coyote tell me about Theodore Roosevelt's taxidermy habits and meetings with John Muir. I gripped it and ripped it and was not all that fond of what I found inside. Uhm, Sorry Charlie. These weren't working for me. Too big, not pretty, didn't smell bad but didn't smell good, I don't know, I threw those fish back. Maybe some other time, maybe not. 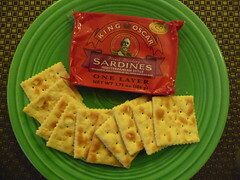 So the other tin I picked up was King Oscar's Med Style. 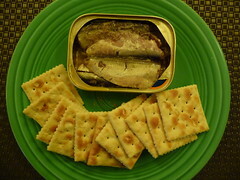 One layer Brisling. These were much more appealing. Dominant Smoke. The fish are a bit mushy and falling apart. The olives and spice are quite qood. 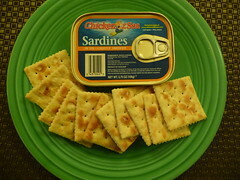 I would love to make a sandwich with a splash of mayo and this tin. All in all just OK. A "C". Average. Sometimes they're just fish. Three out of Five Tins. Having come to this conclusion I must ammend an Earlier Review. The Sunnmøre Sardiner i olje are some fine fish. The Wife just grabbed some Kettle Baked Hickory Honey BBQ chips, a ramakin of sour cream and some King O's. Now That's Some Munchies Food!!! 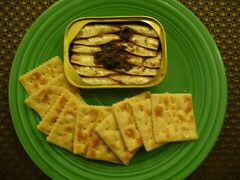 I just had the Chicken of the Sea this weekend. 3 or 4 large fish in soybean oil. Mine didn't have much of a smell at all. Wrapped them up in a couple of tortillas with mayo, Tabasco, and a sprinkle of Parmesan cheese. Worked ok but nothing special. Hi! 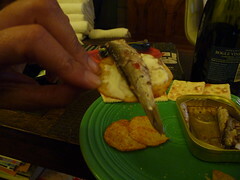 I don't know how to get the word out in the "Blogger" world about some sardines I bought on Cannery Row in Monterey, CA...someone actually brought sardines back to the area and they are seriously the best sardine I have ever had. Here is there website, www.canneryrowsardineco.com Please help spread the word!